They’re back! 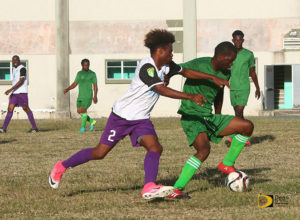 The Islanders—the league’s most dominant team who went on a midseason trip to St Kitts following a loss to the Sugar Boys in their opener—came out in full strength on Sunday afternoon at the A. O. Shirley Grounds and picked up their first BVI Football Association men’s league victory, 3-1 over the Virgin Gorda United. 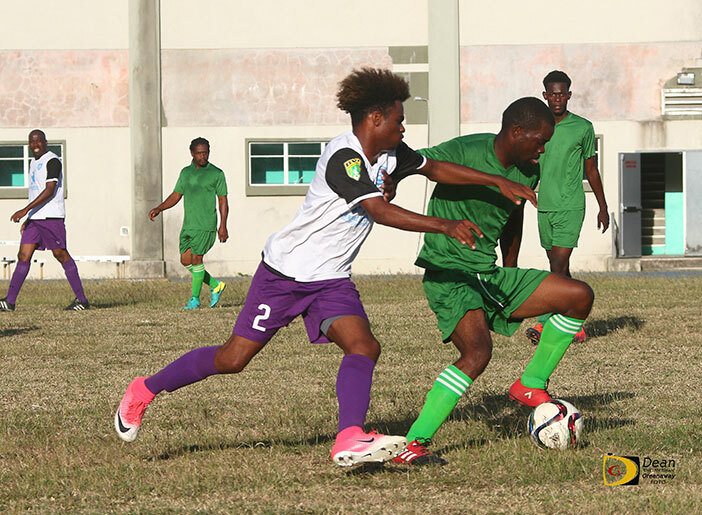 For the first time this season, the Islanders were at full strength and faced a tough test against a confident but winless Virgin Gorda United squad. But, it wasn’t until the second half that the Islanders were finally able to dominate the match, after Rohan “Chi Chi” Lennon scored their first goal in the 38th minute for the Islanders’ 1-0 lead. Joshua Lynch made it 2-0 in the 51st minute, before Virgin Gorda United’s Joshua Ramprashad’s unfortunate own goal, put the game to bed in the 60th minute in the defensive tussle. Clint Thomas beat the Islanders goalie in the 61st minute, merely a consolation as the Islanders ran out 3-1 victors. Islanders captain Andy Davis said they’re glad for the victory but they have a lot of different things to work on. Virgin Gorda United’s coach Glenn Bascombe noted that the Islanders have been champions for a while and they used their experience to get early goals and his team had to fight from behind. On Virgin Gorda in another match between winless teams, league new comers F.C. Sea Argo shocked the Rebels, whose season continues to spiral downhill, with a 3-1 victory. The Rebels broke the score in the 20th minute on Trevor Peters’ goal for a lead they carried into half time, but it wasn’t until deep in the second half that the signs of an “upset” materialized. F.C. Sea Argo’s Omar Elliston equalized the match at 1-1 in the 71st followed by another goal two minutes later from Gavin Foster, for a 2-1 advantage, raising the alarm bells. Janel Ferdinand put the game beyond doubt, scoring in the 86th minute from the penalty spot, giving the jubilant F.C. Sea Argo players their first victory not only in the national league, but in all competition’s since they joined the BVIFA, early in 2017. In the day’s first match, the Sugar Boys made it three wins from three games with a 3-0 triumph over a tenacious Old Madrid, on two Derol Redhead scores. Redhead scored the opener in the 40th minute, fellow front man, Mohammed Kachour made it 2-0 in the 70th minute and then Redhead netted his second and the Sugar Boys third in the 87th. This weekend’s fixtures have been postponed by the BVFA Competition Committee, to facilitate the Masters hosting an over 40 team from St Kitts. Action will resume over the Easter weekend, with two matches scheduled.